Playwright, poet, theatre director, originator of modern Polish theatre. Born January 15, 1869, in Kraków, died November 28, 1907, in Kraków. Playwright, poet, theatre director, and originator of modern Polish theatre. Wyspiański grew up in Kraków during the late nineteenth century when the city was part of the Austro-Hungarian Empire. The place and the community in which he was raised were instrumental in shaping his artistic imagination. His father, Franciszek, a sculptor, had an atelier at the foot of the Wawel hill, home to a cathedral rich with evidence of the strength of the former Polish state, and to a royal castle, by then an Austrian army barracks. Stanisław attended St Anne's Gymnasium. Many of his schoolmates, including Jozef Mehoffer, Lucjan Rydel, Stanislaw Estreicher, were to play major roles in Kraków's cultural life. Instruction was bilingual so the students were thoroughly versed in German language, literature, and culture. A classical gymnasium, St Anne's also equipped its pupils with a thorough knowledge of antiquity - antique motifs would always be present in Wyspiański's work. A former capital city of a once powerful country, now reduced to the status of a smallish, inferior, provincial town, Kraków was a magical place, a point of reference and a challenge to the Polish consciousness of the late nineteenth century. On one hand, tradition was celebrated with pomp, and objects of the past were venerated. On the other, a group of historians emerged from the city's Jagiellonian University, challenging the Poles' vision of history, identifying the causes of national failures and the reasons for undesirable social behaviour. Kraków was also the birthplace of Polish modernism. After his baccalaureate exam, Wyspiański enrolled at the Department of Philosophy of the Jagiellonian University, and at the School of Fine Arts to study painting under Jan Matejko, the painter of large-scale historical canvases. As a student, he and his colleagues were involved in the renovation of St Mary's Church, and, during his summer travels across the Galicia and Kielce regions, he helped to develop a register of objects from the past. His most notable contribution was the discovery, in the village of Kruzlowa, of a fifteenth-century wooden statue of the Mother of God (now kept at the Krakow National Museum and called the Madonna of Kruzlowa). This work must have encouraged him to take a more personal look at his country's heritage as well as increasing his sensitivity to detail in fine arts. Indeed, no matter whether he was looking at an object of art or creating one, his unique imagination made him view the work as a fragment of a historical event. When looking at a painting, a sculpture, or a piece of architecture, he would add a story that would make it dramatic, hence challenging the essentially static nature of fine arts. In Kraków he was able to see the finest Polish actors (including Helena Modrzejewska [aka Modjeska]), as well as taking part in amateur performances himself. Modernism, which was then coming of age, created an awareness of the co-existence of various arts. A student of painting, Wyspiański also tried his hand at writing minor lyrics as well as dramatic scenes that would often comment on his fine arts projects, like his Krolówa Polskiej Korony / Queen of the Polish Crown, which he wrote when working on a stained-glass window for the Lvov Cathedral. Years later, as a mature artist, he designed a series of (unrealised) stained-glass windows for the Wawel Cathedral and wrote poems devoted to the historical personages they depicted. In 1890, Wyspiański travelled abroad, visiting Vienna, Venice, Padua, Verona, Mantua, Milan, Como, Luzern, Basel, stopping for a while in Paris. Having visited the cathedral of Saint-Denis, he went to the famous Gothic cathedrals of Chartres, Rouen, Amiens, Laon, Reims, Strasbourg, and then the Roman cathedrals, down to Nuremberg. He returned to Poland via a number of German towns, watching productions of plays by Goethe, Weber, Wagner and Shakespeare. He wrote detailed letters to his friends - mostly to Lucjan Rydel - which, together with the "Notatnik z podróży po Francji" [Notes on a Trip to France] were to become source material for his (unpublished) study of the French cathedrals. In May, 1891, he went to France again, travelling across Austria and Switzerland, to continue his studies in Paris. Failing to get admitted to École des Beaux Arts, he started to paint in one of the Parisian ateliers within the Colarossi Academy. He loved the productions at Comédie Française, and frequented other theatres, too. Besides painting, he started to write dramas and opera librettos, addressing historical and mythological themes seen from the perspective of the end of the century. His studies abroad introduced him to the latest aesthetic trends, including the modern understanding of applied art and the diverse approaches of European theatre. More importantly, his studies helped him to discover Gothic and the phenomenon of the cathedral as a consummate work of art, the most perfect expression of its age. Ever since that moment, he nurtured a need to create a complete work of art, which, like a Gothic cathedral, would be able to accommodate the entire experience of history and modernity. Wyspiański practised a variety of arts and did so with enormous courage and gusto. He made plans for architectural restorations, in particular for the Wawel Royal Castle; worked on polychrome and monumental stained-glass windows for Kraków's Franciscan church; developed artwork for the modernist literary journal "Życie"; painted; designed furniture; wrote dramas and worked on stage designs for Kraków's City Theatre. He worked fast and with extraordinary intensity, his highly diverse output produced in a mere dozen years. Yet a number of his artistic plans were never implemented, and only some of his dramas made it to the stage. Starting with the November 1898 première of Warszawianka [Varsovienne] - the play that marked his debut as a playwright - he always designed the sets to his works, even though they were not always faithfully followed. An early play of his, Warszawianka, reveals a thorough understanding of modern theatre production, not least in the meticulously composed space, the windows in the back wall playing a major dramaturgical part in directing the attention of both the protagonists and the audience to what is happening in the background. The production used Wyspiański's original, white, black and golden set design, its components (centrally positioned clavichord and Napoleon's bust) are involved in the plot. The Warszawianka song became a leitmotif and a protagonist of the play that was Wyspiański's voice in the debate on the role of historical memory in the consciousness of contemporary Poles. The Lvov premiere on July 2, 1901, starred Helena Modrzejewska as Maria. 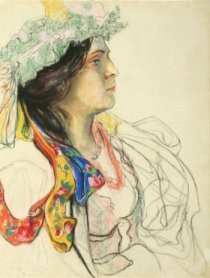 An actress famous for her roles in Shakespeare's dramas, Modrzejewska instantly saw in Wyspiański a great visionary of the theatre. She would later play Laodamia in the first-night performance of Protesilas and Laodamia on April 25, 1903, and it was to Modrzejewska that Wyspiański dedicated his verse on acting. Among the most beautiful and important poems of Polish literature, they were published in Wyspiański's Studium o Hamlecie [A Study of Hamlet] in 1905. Two years after the première of Warszawianka, Wyspiański finished Legion [The Legion], a dramatic production of Adam Mickiewicz's vision of Rome. However, all attempts at staging this epic failed, partly due to the unheard-of scale of the set and partly because of the audacity of its argument with the Romantic version of history. Legion speaks strongly against the Romantic heritage of Messianism that shaped Poland's intellectual and artistic life in the late nineteenth and early twentieth centuries. Wyspiański reveals the implications of a simplified and schematic understanding of that heritage. The key themes of Wyspiański's dramas were best represented in Wesele [The Wedding], the drama which endeavoured to revive the symbolic language used to talk about history and the current situation of Poles. First performed at Kraków's City Theatre on March 16, 1901, the play brought instant acclaim to its author. ‘The Wedding' makes references to major poetic, theatre and fine arts works of Polish culture, most notably to dramas by Fredro and Slowacki, and paintings by Matejko and Malczewski, thus joining the debate on the role of art in shaping the collective imagination. The play shows a bitter picture of the powerlessness of a society that was triply fettered: by the political regime, by the inert national tradition and by the skepticism of its intelligentsia. Its verse was akin to that of Romantic poems: varied, changing moods to accompany plot developments, and abundant in aphoristic phrases that would soon pass into everyday language. It was the first performance in Polish theatre in which, on such a scale, sets defined the scenery, all plastic items played an important role, and the lighting built mood and dramatic tension. The finale - a picture composed without words, solely with movement and melody - was totally innovative. Wesele starred the finest actors of the time, and they played exquisitely. As soon as it was published in April, 1901 (the following edition came out in July of the same year), the play became the subject of numerous studies and discussions. On May 24, Wesele was put on stage in Lvov. By contrast, Russian censorship barred sales of the drama on the territory of the Congress Kingdom, and there was no possibility of a stage production. After the success of Wesele, Wyspiański was entrusted with the staging of Adam Mickiewicz's Dziady [The Forefathers' Eve]. The première took place on October 31, 1901 and was the first instance of a creative staging of a Romantic drama. Wyspiański adapted Mickiewicz's masterpiece, setting it within a single, uniting framework, reducing Messianistic motifs and emphasizing the drama of the main character, played by Andrzej Mielewski, one of the best actors of the young generation and Jasiek from Wesele. In December, Wyspiański published his adaptation under the title of Adama Mickiewicza "Dziady" sceny dramatyczne. Tak jak byńy grane w teatrze krakowskim dnia 31 paźdz. 1901 [Adam Mickiewicz's Dziady. Dramatic Scenes. As They Were Played in the Kraków Theatre on October 31, 1901]. Next the adaptation had its première in the Teatr Polski in Poznan on November 1, 1902 and was played in theatres all over Poland for the following twenty years. One could say that this staging marked the birth of modern adaptation and, perhaps more importantly, was a reference for all adaptation trends appearing in Poland throughout the twentieth century. Quite naturally, all subsequent premières of Mickiewicz's drama would be compared with Wyspianski's. For him, Dziady was a starting point for his own production that entered into a dialogue with Mickiewicz's work while being an expressive example of his artistic method. Indeed, Wyspiański keeps asking questions - of his predecessors and of himself - hence so many intertextual references. He processes the works of others, includes them in his thinking, while continually changing and re-writing his own texts. Everything is in constant motion; a never-ending review is necessary. Wyspiański's key theme was freedom of the individual. His dramas and adaptations tested and ultimately denounced all freedom-curbing mechanisms. The theatre proved the medium best suited to his artistic temperament, every première probing a text torn from an out-of-date context. Wyzwolenie [Liberation] was another step in Wyspiański's dialogue with Mickiewicz. Published in January 1903, the drama boasted Konrad, the hero of the adaptation of Dziady, as its main protagonist (played by the same actor, Andrzej Mielewski, in the first performance on February 28). Set on the stage of the Kraków theatre, the plot is about the role and tasks of theatre art in the shaping of modern society. Wyspiański renounces stage illusion, exposing the "naked stage" stripped of deluding sets. Equally, he unveils the tragedy of theatre unable to get out of the vicious circle of play and pretence. On May 7 the same year, the première of Boleslaw Śmialy [Boleslaus the Bold] took place, Wyspiański's drama which came out in print a month later. The plot goes back to the origins of Polish statehood and asks questions about aspects of Polish history. The staging presented a symbolic outline of the events of the twelfth century as well as of the legend that grew around them. Wyspiański designed sets that were styled in the vein of Kraków and Zakopane folklore, and costumes that made the protagonists look monumental, imposing a certain way of acting. Such an approach to the characters' appearance would have a major impact on later experiments in the Polish theatre and would, years later, be adopted by Tadeusz Kantor's theatre. Wyspiański took up the theme of the conflict of Boleslaw Śmialy and St Stanislaus again in Skałka / The Rock, a drama published in 1907 and not staged in his lifetime. In July 1903, a bilingual edition of The Iliad came out. Wyspiański designed and illustrated it; Juliusz Slowacki's paraphrase was used as the Polish version. In December, Wyspiański finished Achilleis, a drama alluding to Homer's epos. Wyspiański received a painful blow when he was not allowed to work on the restoration of Wawel after the Austrian army vacated the Royal Castle in 1904. After all, Wawel was Wyspiański's fascination, a symbolic place that embodied not only the essence of Polish history and culture but also of European civilization, a place that combined Biblical and antique traditions. Wyspiański devoted a prophetic drama to the site, Akropolis (1904) as well as a redevelopment scheme, Akropolis. Pomysl zabudowania Wawelu [Wawel Redevelopment Concept] (Kraków, 1908), prepared in collaboration with the architect, Stanislaw Ekielski, and envisaging the hill becoming a spiritual, political and cultural centre for Polish people. Akropolis caused controversy and led to a conflict between Wyspiański and the Kraków theatre; it ended with Wyspiański banning the staging of his works. Noc listopadowa [November Night], Wyspiański 's last drama, and devoted to the uprising of 1831, was published in November, 1904. In December that year, influenced by conversations with Kazimierz Kamiński (the actor who played the part of Stańczyk in Wesele), Wyspiański wrote, Studium o Hamlecie [A Study on Hamlet], a treatise on the tasks of the theatre. Published in 1905, the Studium incorporates fragments of poems testifying to Wyspiański's fascination with the art of acting. It includes an example of the reading of a drama with regard for the society in which the staging is produced, as well as some detailed staging ideas, including the use of the Wawel hill as the setting for one of Shakespeare's tragedies. Indeed, views of Hamlet are intertwined with thoughts on the mystery of producing a play and on the implications of the double status of the actor whose powerful art is able to lay bare the falseness and hypocrisy of the world. The Studium inspired other authors, including Stanisław Brzozowski and Tadeusz Micinski, to write about the role of modern theatre, and proved a major reference to succeeding generations of theatre makers. In early 1905, Wyspiański competed to lease Kraków's City Theatre, devising its repertoire and production plans, and writing a scene, Smierc Ofeli [Death of Ophelia] ("Nowa Reforma" 1906 no. 114). The Kraków City Council rejected his bid; Ludwik Solski was appointed director of the Theatre. This new appointment encouraged Wyspiański to lift the ban on the staging of his plays; he did not, however, stage another première. In May, 1905, he was elected to the City Council, but, in December that year, his health started to deteriorate rapidly. Nevertheless, he continued to work on the dramas, Sedziowie [Judges] (1907) and Powrot Odysa [The Return of Odysseus] (1907), and on the translation of Corneille's Le Cid (1907, first performed on October 26, 1907). In mid-1906, he moved to Wegrzce near Kraków and spent his last months writing the drama, Zygmunt August, published in magazines. There remained manuscripts including fragments of dramatic scenes devoted to historical personages. On the anniversary of Wyspiański's death, the Kraków Theatre put on Legion. 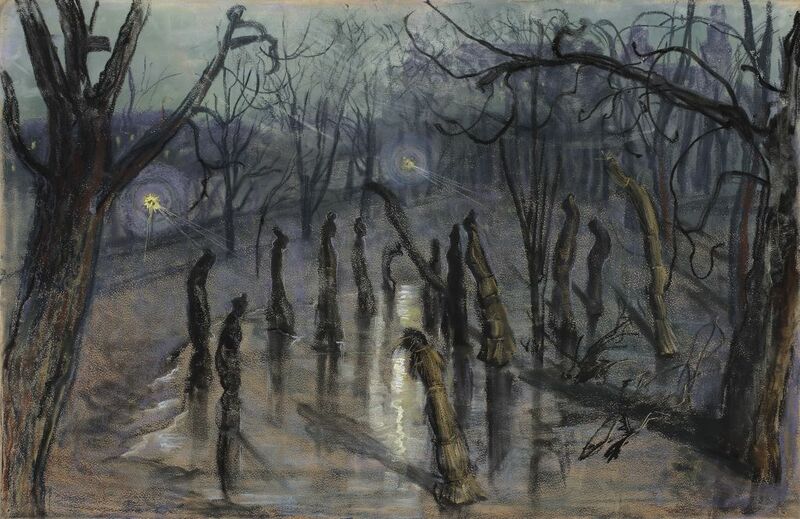 The production had nothing to do with Wyspiański's modern thinking and only proved the importance of his staging concepts and skill in conveying the meaning of his works. Soon after his death, Wyspiański's friends and literary experts set out to edit his manuscripts and to publish a complete critical edition of his works. Adam Chmiel and Tadeusz Sinko, in association with Leon Płoszewski, prepared the first edition of "Dziela" [Works], vol. I-VIII, Warsaw, 1924-32. Shortly afterwards, another publication edited by Płoszewski - "Dziela zebrane" [Collected Works], vol. I-XVI, came out. The latter included a bibliography as well as a "Kalendarz życia i twórczosci" [Calendar of Life and Work], Kraków 1958-1995. This edition is complemented by "Listy zebrane" [Collected Letters], vol. I-IV, Kraków 1979-1998. Researchers of Wyspiański's work were aware of the uniqueness of his stage concepts, hence the publication of "Wesele. Tekst i inscenizacja z roku 1901" [Wesele. Text and the 1901 Staging], ed. J. Got, Warsaw, 1977 - a book documenting the première of the drama, published irrespective of subsequent editions of the play. The role of Wesele in Polish culture is also emphasized by a publication that no other work of Polish literature ever boasted, namely "Encyklopedia 'Wesela' Stanisława Wyspianskiego" [The Encyclopedia of Stanisław Wyspiański's "Wesele"] by Rafal Wegrzyniak, Kraków, 2001. Although it was written at the very start of the twentieth century, Wesele is considered not only the most important but also the best Polish drama of that century. Its symbols gave rise to expressions that have passed into the language describing the collective behaviour of Poles, such as the "golden horn" (a metaphor for lost hopes) and the "Straw Man dance" (a symbol of overpowering enchantment with illusory ideas). They have been alluded to in literature, theatre and film – see, for example, the scene of the polonaise in Andrzej Wajda's Popiol i diament [Ashes and Diamonds]. Wajda also turned Wesele into a film (in 1973), thus enabling a larger audience to become acquainted with Wyspiański's work. Wyspiański's vision of theatre has in different ways inspired major twentieth-century Polish theatre directors. To Leon Schiller, Wyspiański was, alongside the Polish Romantics, a patron of the concept of monumental theatre. In 1909, Schiller published an essay entitled "The New Theater in Poland: Stanisław Wyspiański" in the journal "The Mask" edited by Gordon Craig. By doing so, he introduced Wyspiański's accomplishments to the European theatre reform. Schiller laid down his views on Wyspiański in a "policy statement" paper, "Teatr ogromny", delivered in 1937. Prior to that, in 1929, he had used the director's copy and set design plans to re-create the première staging of Bolesław Smialy, which he considered an excellent example of modern theatre. Earlier, in 1925, Schiller put on Achilleis using Formist sets designed by Andrzej and Zbigniew Pronaszko. Wyspiański's thoughts on the role and dignity of the art of acting were studied by Juliusz Osterwa. "Studium o "Hamlecie" was read and analysed in his Reduta Theatre, inspiring its student, Jacek Woszczerowicz, to stage it a few times. Wyspiański was also one of the key patrons of Tadeusz Kantor's theatre. Kantor would refer to themes from Wyspiański's clandestine 1944 production of Powrot Odysa in his manifestos and theoretical works as well as including them in a number of his performances, most notably in Nigdy tu już nie powrócę [I Will Never Return Here], the première of which took place in Milan on April 23, 1988. His pursuit of the essence of theatre and of a new understanding of acting led Jerzy Grotowski and his Laboratorium Theatre of Opole and Wrocław to the experience of the Reduta and, through it, to Wyspiański. Drawing on Wyspiański's Studium, the Laboratorium Theatre put on Hamlet in 1964 and, before that, Akropolis (first version in 1962, fifth and last in 1967). Grotowski drew more inspiration from Wyspiański's idea that drama represented the most important elements of European tradition as uncovered at the Wawel. Having lived through World War II, Grotowski set the plot in the Auschwitz-Birkenau death-camp. Like Wyspiański, he did not create a closed work, but continually changed and processed his initial ideas. Wyspiański's work found an accurate and revealing interpreter in Konrad Swinarski. He put on Klatwa [The Malediction] and Sedziowie [Judges] at Kraków's Stary Theatre as one performance, premièred on December 1, 1968. Later, a year after his original 1973 staging of Dziady, he put on Wyzwolenie at the same theatre (the part of Konrad in both performances was played by Jerzy Trela). Wyspiański was also a key inspiration for Andrzej Wajda. Wajda put on Wesele a few times, also in German, with German actors - this performance had its première during the Salzburger Festspiele on July 27, 1992. He also twice staged Noc listopadowa, first at Kraków's Stary Teatr in 1974 then at the open space of the Warsaw Lazienki Park, filming the production for the TV Theatre. This way he fulfilled Wyspiański 's dream of a theatre made in real, meaningful places. Wyspiański was also Wajda's inspiration for several productions of Hamlet, especially the latest one, first performed at the Stary Theatre on June 30, 1989, with Teresa Budzisz-Krzyzanowska in the title role. A Wyspiański-derived way of thinking about tradition and staging space was also taken up by Jerzy Grzegorzewski, who, like Wyspiański, included in his performances references to his most cherished works of literature, fine arts and film. Directing Dziady on two occasions, he interpreted them through images derived from Wyspiański. He also made three stagings of Wesele, the last one at the Warsaw National Theatre on January 30, 2000. The same theatre was home to Jerzy Grzegorzewski's première of a moving stage adaptation of Studium o "Hamlecie" on September 28, 2003. Grzegorzewski's last production, On. Drugi powrot Odysa [He. The Last Return of Odysseus] (January 29, 2005) was also a dialogue with Wyspiański 's ideas about art, the fragility of life, and death. As director of the National Theatre, Grzegorzewski demonstrated that Polish theatre should be founded on what is most creative and vital. In other words, Wyspiański proved to be the fundamental pillar of Poland's twentieth-century theatre. M. Prussak, Wyspiański w labiryncie teatru, Warszawa, 2005. - On January 15, Stanisław Mateusz Ignacy Wyspiański is born in Kraków to Maria nee Rogowska and Franciszek Wyspiański. - The Wyspiański family moves to the Dlugosz house at 25, Kanonicza Street near Wawel. Franciszek Wyspiański has his sculpture studio there. - Stanisław starts his education at the School of Exercise, housed in the Larisch Palace in Franciszkanska Street. - Maria Wyspiańska, Stanisław's mother, dies on August 18. - Stanisław continues his education at St Anne's Gymnasium, known as the Nowodworski Collegium. His first sketchbook reflects his budding interest in painting. - An orphaned gymnasium pupil, he is taken care of by his aunt, Joanna Stankiewiczowa and her husband. He lives with them first in Kopernika Street and later in Zacisze Street. He receives his first artistic guidance from Jan Matejko, a friend of his aunt and uncle's. - On the strength of his talent, he is admitted as a special-status student to the Division of Drawing at the Kraków School of Fine Arts. - Having passed his school-leaving examinations, he sets off on a trip across eastern Galicja. He stops at Lvov, Drohobych, Rohatyn, Stanislavov, Bohorodchany and Halych, making sketches of old buildings and art, and taking notes. The trip was Wyspiański's first source of artistic experience and bewitchment. - In October, he enrols as a regular student at the Division of Drawing of Kraków's School of Fine Arts and the Faculty of Philosophy of the Jagiellonian University, where he studies the history of art and classical history. He is a keen contributor to the scholarly pursuits of the university. - He receives the Kraków Mayor's and the Domestic Department's foreign study grant. Under the guidance of Professor Wladyslaw Luszczkiewicz, he takes an artistic trip to the area of Podkarpacie, bringing back drawings of old architecture and art as well as the late Gothic sculpture of the Madonna of Kruzlowa, which he presents to the National Museum. At Jan Matejko's request, he starts to work as a technical hand, carrying out Matejko's polychrome designs on the walls of St Mary's Basilica. - From March to September, he travels across Europe, tracing medieval art, making sketches and writing descriptive letters to friends. - In May he enrols at the Colarossi Academy in Paris. He works on a design for Prague's Rudolfinum, becomes interested in theatre and writes the drama, Daniel. - Stays in Paris until September. Together with Jozef Mehoffer, he designs St Mary's window for St Mary's Church in Kraków and, like Mehoffer, designs a curtain for the competition announced by the Kraków City Theatre. Writes the drama, Wanda, and starts to write Legenda I / Legend I. - Travels to Lvov in October, in connection with the competition for a stained-glass window for the city's cathedral. Continues to paint oils and corresponds extensively. - From February to October he stays in Paris for the second time. He makes an oil painting of the stained-glass designs, Śluby Jana Kazimierza / Jan Kazimierz's Vows and Polonia. Becomes interested in the opera theatre, writes the drama, Krolowa Korony polskiej / Queen of the Polish Crown, and the first version of Warszawianka / Varsovienne. - From March he works in Paris. While continuing to paint city landscapes in oil, he tends to use the pastel technique for portraits, nudes and representations of interiors. Starts to work on the drama, Meleager. - In September, he returns to Kraków. Parts with the oil technique with three landscapes of autumn Kraków: Z Zacisza na Teatr Miejski i Barbakan / A View of the Town Theatre and the Barbican from Zacisze and Planty z widokiem na Wawel / Planty Park with a View of the Wawel. - Receives his first major order, for the polychrome inside the chancel of the Kraków church of the convent of Franciscan Fathers. - Is involved in the restoration of medieval stained-glass windows saved from the fire of Kraków's monastery church of Dominican Fathers. - Moves in with his aunt, Joanna Stankiewiczowa, by then a widow, to a flat in Grabowski house in Poselska Street with a view of the dome of St Peter and St Paul's Church. - His first daughter, Helena - Helenka, is born (d.1971). - Designs and makes the polychrome inside the Franciscan Church. - Develops specifications for the polychrome inside Kraków's Holy Cross Church. - Makes illustrations for Song I of Homer's Iliad. - Continues work at the Holy Cross Church, copying its old polychrome at a scale of 1:1. - Receives another commission, this time to make eight stained-glass windows for the Franciscan Church. - Wyspiański designs Bóg Ojciec - Stań sie / God the Father, Cztery żywioly / Four Elements, Blogoslawiona Salomea / Blessed Salomea and Stygmatyzacja św. Franciszka / St Francis' Stigmata. The latter earns him a prize at an exhibition of religious art in Kraków. - He co-founds the "Sztuka" Society of Polish Artists and exhibits his works. - Starts to write the drama, Protesilas and Laodamia and finishes Meleager and Legenda I. - He begins to contribute to the bi-weekly, "Życie". - In February, he participates in the competition exhibition of the Warsaw Society for the Promotion of Fine Arts. This is his only visit to Warsaw. - Is appointed – along with Stanisław Przybyszewski - art manager of the bi-weekly, "Życie". - Publishes his dramas, Meleager, Lelewel, Protesilas and Laodamia and Klątwa / The Malediction. - Stages Apoteoza ku czci Adama Mickiewicza / Apotheosis of Adam Mickiewicz at the Town Theatre. Takes part in the life of Kraków's artistic bohemia and makes pastel portraits of its members. - Tadeusz Pawlikowski, the Director of the Town Theatre, puts on Warszawianka (directed by Ludwik Solski). - Designs a poster of Maurice Maeterlinck's poem, Interior. - Rents a studio near St Mary's Church and paints town views. - His second child, son Mieczyslaw - Mietek, is born (d. 1921). - Starts working on the Wawel stained-glass window design. - Publishes rhapsodies, Kazimierz Wielki, and Boleslaw Smialy. - Marries the mother of his children, Teodora Teofila Pytko, on September 18. - Moves with his family to 157, Krowoderska Street, and arranges his "sapphire studio" there. - Writes the dramas, Wesele / The Wedding (premièred in Kraków on March 16), Noc Listopadowa / November Night, Legenda II. - Stages Adam Mickiewicz's Dziady / Forefathers' Eve. The première takes place in Kraków on October 31. - His last child, son Stanisław - Stas, is born (d. 1967). - Works on the dramas, Wyzwolenie / Liberation, and Boleslaw Smialy. - Is appointed Associate Professor at the Faculty of Decorative and Religious Art of the Academy of Fine Arts. - In August takes his only trip to the Tatra Mountains. - Takes part – as a member of the "Sztuka" art group - in the 15th exhibition of Art Nouveau in Vienna. - Produces his first Widok na kopiec / View of the Mound, a fluoro-etching. - Wyzwolenie is premièred on February 28. - His Wawel stained-glass designs are included, as part of the "Sztuka" Group, in the 4th exhibition of Warsaw's Zacheta Society for the Promotion of Fine Arts, before transferring to Vilno in April. - Works on the dramas, Achilleis, and Akropolis. - His drama, Protesilas and Laodamia, is premiered in Kraków in April, starring Helena Modrzejewska. - May sees the première of his drama, Boleslaw Smialy, and its first and only publication. - Spends June and July in Rymanow-Zdroj to improve his health. - While in Rymanow, he writes the poems, Gdy przyjdzie mi ten swiat porzucic / When I Have to Leave this World, and Niech nikt nad grobem mi nie placze / Let No One Cry Over My Grave. <- A bilingual edition of Homer's Iliad with Wyspiański's illustrations is published in Lvov. - Travels to Venice in September. - Resumes work on the God the father stained-glass window for the Franciscan church. - The only edition of Akropolis comes out in March. - Starts writing Raptularze / Diaries in May. - On June 9, the Pony of Zwierzyniec (Lajkonik) goes capering in a costume designed by Wyspiański - and has continued ever since. - His paintings are exhibited (with the "Sztuka" Group) at the Dusseldorf Exhibition. - Goes for treatment to Bad-Hall in Austria. Visits Vienna on the way back. - Designs the interior of the Boleslaw Centre for the anniversary exhibition of Kraków's Society of Friends of Fine Arts at the Palace of Art - the Society's seat. - Designs the interior of the House of the Medical Society in Kraków. - Develops specifications for the costumes of the drama, boleslaw Smialy ("Boleslaw dolls"). - Work commences to mount the God the Father stained-glass window inside the Franciscan church. - Designs Zelenski's house interior. - In November designs the Apollo stained-glass window for the Medics House. - Starts to work on the concept of developing the Wawel hill (Wawel-Akropolis). - In December, he makes the first few of a dozen views of the Kosciuszko Mound. - Works on Studium Hamleta / A Study of Hamlet. - His works are included in the printing exhibition organised by the Polish Applied Arts Society. - Has a solo exhibition at Kraków's Palace of Art. - Studium Hamleta is published. - Works on Powrot Odysa / Return of Odysseus. - From January to February, he works on a series of views of the Mound, known as the Kronika kilku dni / A Chronicle of a few Days. - Applies for the post of director of the Kraków theatre. - Meets Jozef Pilsudski, Stefan Zeromski, Wladyslaw Reymont. - Continues to develop the concept of Wawel-Akropolis (with the architect, Ekielski). - From March to April he participates, with the "Sztuka" Group, in the 23rd Art Nouveau Exhibition in Vienna. - Corresponds with the literary critic, Stanisław Lacki. - Sends his paintings to exhibitions in Munich and Dresden. - Executes the Apollo stained glass for the Medics' House. - Becomes a city councillor. - His deteriorating health requires more treatment at Bad-Hall. - Continues to work on Skalka. - Translates Corneille's Le Cid. - Writes poems Pociecho moja ty ksiazeczko / You are my comfort, my princess and O kocham Kraków(O I love Kraków). - His health gets worse. - Translates Act 5 of Voltaire's Zaira. - Receives the Probus Barczewski Academy of Competence Award (2,250 crowns) for the series of Kosciuszko Mound views. - His Veni Creator hymn from 1905 is published by "Chimera", the art magazine. - In September he moves with his family to a newly bought house and farm in the village of Wegrzce near Kraków. - Skalka appears in print. - Jozef Kotrabinski publishes a paper on Wyspiański, translated for "Revue Slave" by E.L. Wagner. - Prussian authorities suppress Wyspiański's dramas in the Wielkopolska region. - Return of Odysseus comes out in print. - Writes scenes of dramas, Zygmunt August, and The Death of Barbara Radziwiłłówna. - Continues to work hard despite further deterioration of his health. - Sędziowie / Judges appears in print. His dramas are staged in towns in all three partition areas: in Vilno, Sosnowiec (The Wedding) and Warsaw (Boleslaw Smialy). - Last visitors come to Wegrzce: Mehoffer, Reymont, Staff. - Helped by his aunt, Wyspiański makes the final selection of his works. - He is transferred to Kraków's hospital in Siemiradzkiego Street. - He dies on November 28, 1907. - Wyspiański's funeral takes place on December 2, the town bearing the cost. His body is laid inside the Crypt of the Distinguished in the "Na Skałce" Church.